The marketing behind Godzilla: King of the Monsters has to be one of the coolest promotional campaigns in recent memory. The Monarch Sciences website and social media accounts allow fans to track the new monsters and read up on new scientific findings, making it all immersive and seeming very real. In the latest set of teases, the eerie sounds of Mothra, King Ghidorah, and Rodan are put on full display, giving viewers a sense of the impending dread that is about to hit theaters. The three new teasers are setting up for the main event, which is tomorrow when the second trailer arrives. The latest Godzilla King of the Monsters tease was released just this morning and it's for Monster Zero, aka King Ghidorah. It's an extremely short video preview that shows off the huge new monster and reveals its low sounding roar. It sounds a lot better on headphones than through laptop or phone speakers, which is much different than Mothra's. The Mothra teaser was released yesterday and the Queen's scream is not something that you want to hear on headphones. It's a high-pitched, ear piercing squeal. The final Godzilla: King of the Monsters tease is for Rodan, aka The One Born in Fire. Rodan looks terrifying flying across a fiery sky, and the roar is more of a balance between King Ghidorah's and Mothra's. It sounds like a creepy growl that is neither high-pitched or as low as Monster Zero's. 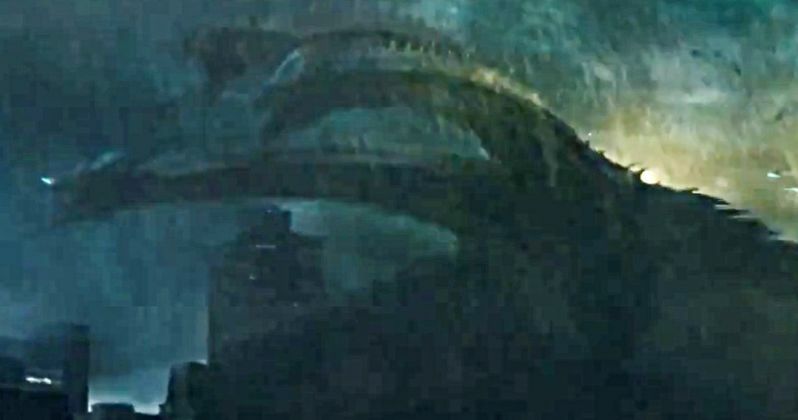 The movie looks epic, even in these quick 4-second teasers setting up the second Godzilla: King of the Monsters trailer. Director Mike Dougherty recently revealed that the post-production process on the movie is complete and ready for its premiere next year. Last week, Mike Dougherty was in Tokyo promoting Godzilla: King of the Monsters by giving an awesome new look at all of the monsters. The director shared official concept art as well as some toy prototypes that featured some pretty ridiculous detail. Godzilla was first out of the gate, sporting some bigger toes and longer tail. While it's always cool to see Godzilla, we've seen him a lot, so the main focus was put on Mothra, King Ghidorah, and Rodan, giving fans their best look yet at the newly designed monsters. Brazil Comic-Con is currently going on, which is where the second Godzilla: King of the Monsters trailer will debut. Everything looks huge and epic from the promotional material that has been released so far, but we're all hoping to see a lot more of the monsters in trailer number 2. Hopefully they deliver the monster goods, teasing the massive stars of the movie. The monsters will all meet up on the big screen on May 31st, 2019 but you can check out all of the new monster teases below, thanks to the Monarch Sciences Twitter account.